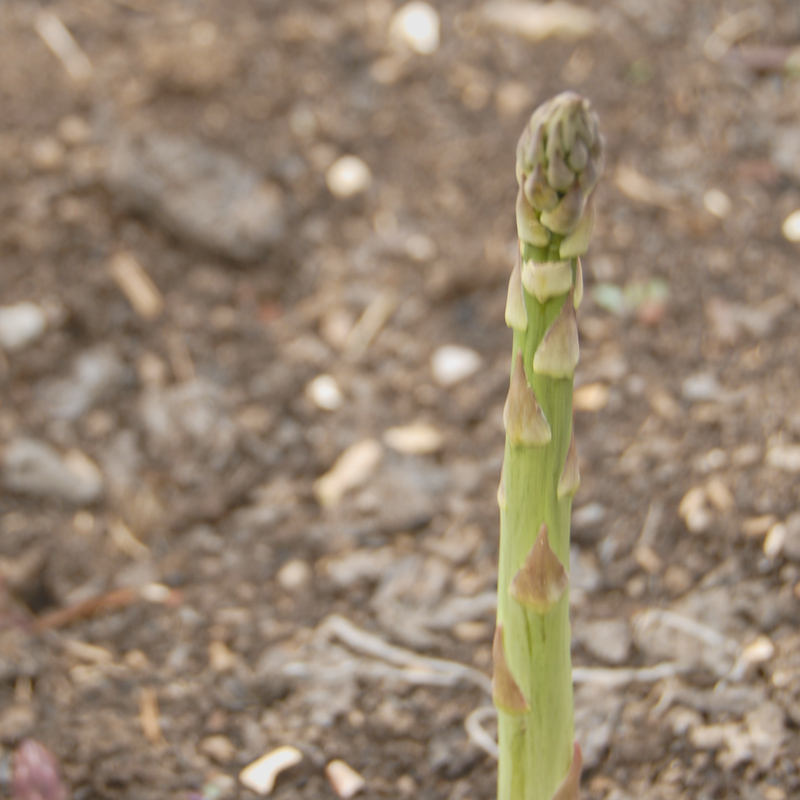 There are few things more dramatic in the vegetable garden than the way the first of the new season’s crop of asparagus suddenly and proudly pushes its head out of the the soil. The arrival of the asparagus crop signals a turning point in the growing year, when the other early vegetable envoys for the new season start to limber up, getting ready to take their bow in the warm sunlight of Spring. And there can surely be few gastronomic pleasures as sublime as the taste of a freshly picked, succulent, locally grown spear of asparagus. For ten months of the year asparagus is transported many thousands of miles from Peru and Mexico onto our supermarket shelves. This stuff gives asparagus a bad name. After all those air miles it is often dry, woody and almost tasteless, inferior in every way to the mouth-wateringly sensual locally-grown asparagus which is in season right now here in the UK. Aside from the environmental and taste arguments, there are also good health reasons for eating locally grown, fresh asparagus. There is plenty of evidence from research in the USA and Europe to suggest that the greater the distance our food has to travel the more its nutritional content is affected. Like Peruvian asparagus, much of the “fresh” produce sold in supermarkets has in fact been transported thousands of miles and is several days old by the time it goes into our shopping trolley. Elapsed time is critical to food quality. Leave any fruit or vegetable lying around and it will undergo physiological change. Starch will begin to convert to sugar, attracting yeast, mold and bacteria. At the same time any bruising or imperfection will cause oxidisation, which leads to discolouration and, eventually, rot. Some fruit and vegetables produce ethylene after harvest, which accelerates the ripening process. These processes all begin from the moment the fruit or vegetable is picked. Some supermarkets use refrigerated transport and modified atmosphere packaging to slow down the rate of deterioration of “fresh” produce. Research suggests this process can itself impact on vitamin and antioxidant levels inside the packaged produce. The bottom line is that by the time they end up in our shopping trolley imported fruit or vegetables will have already have lost a proportion of their nutritional value. In fact, in some cases you may even be better off buying frozen vegetables rather than imported “fresh” vegetables – a report several years ago by the UK’s Food Standards Agency concluded that imported vegetables not only have much higher levels of nitrates (which research suggests may be linked with an increased risk of certain cancers) but also far fewer nutrients than frozen versions of the same vegetables. I’m using some beautiful, home-grown asparagus in this week’s recipe. It has travelled just one mile, from my allotment plot, the Circus Garden, in my bicycle basket, a journey of five minutes if I pedal fast enough and the wind is in the right direction. The batter in this recipe is beautifully light and delicate, allowing the flavour of the asparagus to shine through. 1. First make the aioli. Put the egg yolks, garlic, sea salt and lemon juice in a food processor and blend together until smooth. Keep the processor running on a slow speed and very slowly add the olive oil in a steady stream until it forms a thick sauce. 2. Tip the aioli into a bowl. Add the chopped gherkin and spring onion and mix to combine. Set to one side. 3. Remove any woody stems from the asparagus (do this by holding the asparagus spear in one hand about two thirds of the way down from the delicate tip. In the other hand hold it near the base. Gently bring your hands towards each other, bending the asparagus spear until it snaps. The lower portion is the woody stem and should be placed in your compost recycling). 4. Steam the asparagus for 2 minutes then plunge into ice cold water to arrest the cooking process. Drain on kitchen paper. 5. Now make the batter. Place the flour, corn flour, sea salt and beer in a bowl. Whisk together into a smooth batter. In a separate bowl whisk the egg whites until they form stiff peaks. Using a wooden spoon, add a quarter of the egg whites to the beer batter and stir gently to combine. Now carefully fold in the remaining egg white. 6. Fill a large pan with the groundnut oil to a depth of 4 cm. Place over a high heat. It is important to get the oil to the right temperature before starting cooking so that the batter comes out crisp. The oil is ready when it is hot enough to turn a cube of bread brown within 30 seconds. 7. Dip the asparagus spears into the batter, making sure they are fully coated, then place them carefully into the hot oil. Cook them in batches to prevent the oil temperature dropping too drastically when the asparagus is placed in the pan. Cook for 2 to 3 minutes, turning to ensure an even golden brown colour. Serve hot with the lemon and garlic aioli and lemon wedges. Oh gosh, that really does look fabulous. Love your style Circus Gardener – you’re fast becoming one of my favourite blogs on t’internet. And I must MUST plant up an asparagus bed this year. Being something of a lazy gardener, I love the idea of perennial vegetables; I’ve got some cardoons just sprouting now, I can imagine cardoon fritters going nicely with aioli too. Thank you very much for your lovely comments. Growing asparagus requires plenty of patience – it takes three years after planting before you can pick it, but then the plants will crop for 15-20 years. I do like the sound of your cardoon fritters. Cardoons are hard work to prepare in the kitchen but such a lovely plant, and very popular with bees – I’ve often seen them on the allotment buzzing drunkenly around the thistley flower heads. I totally agree that local, seasonal food is the best from both an environmental and nutritional point of view. I love the sound of your asparagus and it looks delicious too. Thanks Sarah. I admire your patience! Zo has insisted I make this for her… and her wish shall be my command! Great! I promise you she won’t be disappointed! Thank you! Like you, I think asparagus is beautiful unadorned. This recipe is a little different, but the asparagus remains the star. Wow! Delicious. We had our first asparagus today with our own poached free range eggs. Heavenly! Thank you! Asparagus and poached eggs is such a great combination and in fact it featured in my first post on this blog, almost a year ago. I’m sure it must taste all the better when it’s eggs from your own hens! Having had a quick glimpse of some of your other lists I think I have some serious reading to do!